The making of . . .
My original intention when doing these “making of” posts was to present a tutorial, whether that tutorial gave the technical details of a particular photo, or how to achieve and effect, or even how to duplicate my results; it didn’t really matter. The point was to give a reader the “formula” of the creation of the photo. What it has turned into instead is the recitation of an anecdote of how the photo came to be. I will eventually start producing proper tutorials, but the anecdotes are a lot easier to write and a lot more fun for me. The headline photo has become one of my favourites since I took it. I suppose it doesn’t hurt that it is of my son. We were about to head off to the wedding, Kiran was well dressed and becoming quite restive, he didn’t really like being dressed up but not going someplace. I couldn’t resist taking a few pictures of him, so I asked him to pose. This is often a hit or miss exercise. Sometimes he enjoys posing for the camera, sometimes he seems to feel an unwanted obligation. And sometimes he simply won’t do it. This I think was one of those occasions where he felt obligated, but didn’t really want to oblige. I think you can tell from the expression on his face, he was quite annoyed at daddy’s request. 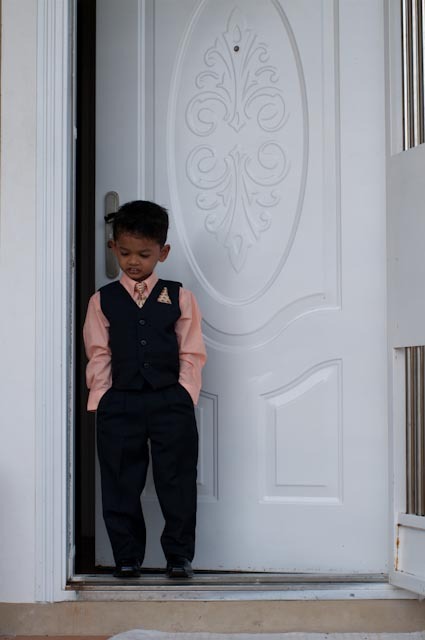 I am pretty sure he was quite full of himself at being so dressed up too 🙂 I certainly didn’t ask or encourage the specific pose, I just asked him to stand in the slightly ajar door. I had done a previous shot in this spot and I liked the defining line created by the dark interior of the house and the largely negative space provided by the white door. I hadn’t gone quite this far with the previous shot though. As far as post processing (I use Adobe Lightroom) goes essentially, what I did was to ramp up the exposure 1 3/4 stops, increase the brightness to 68 (out of 100) and desaturate the photo. I usually prefer to use Lightroom’s black & white process as it tends to produce a nicer tonal mix than simply desaturating the photo, but in this case I wanted just very high contrast black against white. I also increased the blacks to 40 (out of 100) which is very high for an accurately exposed photo. I also used a lot of fill light to lighten the shadows. The final step was to crop the image slightly to get rid of the security grill. The high contrast processing hadn’t blown the grill out (like it did the white door) and I felt it unbalanced the image to have another evenly weighted element opposing Kiran. The bottom line is, as you can see from the completely unprocessed photo below, I had something good to start with and made real drama therefrom. I like the “How to” posts you do, and this one has a dramatic before and after 🙂 Strange enough I never think to go for so much contrast, but it gives a very nice effect when used in the correct way. love the article. Hope to see more. I actually started a fb page to get photographers to talk about their work, share ideas, etc if you’re interested. Can’t wait to read your next article. I really like this shot, and the high contrast processing you’ve used. Nice work.